Smithsonian Institution Scholarly Press, 9781944466053, 286pp. With loss of habitats throughout the world occurring at a staggering rate, it is critical to document what is being lost. 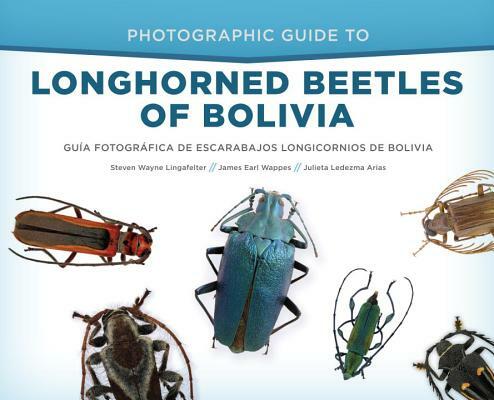 This book strives to do that by focusing on longhorned woodboring beetles in Bolivia. Wholesale clearing of large tracts of land kills everything or forces species to move quickly to other areas, disrupting the balance of the ecosystem. This book will help people discover and appreciate some of the amazing diversity of life that exists in the undeveloped and/or remote natural areas of Bolivia. Nearly 1,900 species of longhorned woodboring beetles (Disteniidae, Vesperidae, and Cerambycidae) are known from Bolivia (with more than 200 species yet to be determined). This work features 500 of them, representing the breadth of morphological evolution. Steve Lingafelter was a research entomologist for the U.S. Department of Agriculture based at the Smithsonian Institution’s National Museum of Natural History in Washington, D.C., for nearly 20 years. Last year, arelocation opportunity arose in Arizona, and he becamean insect identifier on the Mexican border. Steve received his PhD in entomology from the University of Kansas in 1996. Steve has made seven expeditions to Bolivia starting in 2002. He has published over 60 papers and four books on beetle systematics and taxonomy, with an emphasis on neotropical longhorned beetles. Jim Wappes is the founder and curator of the American Coleoptera Museum in San Antonio, Texas. Jim received his BS in agriculture (entomology major) from Purdue University in 1968. He has collected Cerambycidae and studied cerambycid taxonomy for more than 50 years. Jim worked extensively in Mexico and Central America prior to the Bolivia Cerambycidae Project. Since 2000 he has made 30 expeditions to Bolivia and published more than 25 papers on neotropical longhorned beetles. Julieta Ledezma Arias is a research entomologist and head of the Department of Invertebrates at the Noel Kempff Mercado Natural History Museum in Santa Cruzde la Sierra, Bolivia. She is also Professor of Ecology in the Faculty of Pharmacy and Biochemistry at the Universidad Autónoma Gabriel Rene Moreno. Julieta is a specialist on butterflies and has published over 20 papers on the Bolivian fauna, including several books. Julieta Ledezma Arias es Bióloga y jefe del Área de Invertebrados del Museo de Historia Natural Noel Kempff Mercado, profesor de la asignatura de Ecología de la Facultad de Ciencias Farmacéuticas y Bioquímica de la Universidad Autónoma Gabriel Rene Moreno, Santa Cruz de la Sierra, Bolivia. Julieta es especialista en mariposas y hapublicado más de 20 artículos sobre la Entomofauna Boliviana, incluyendo varios libros.